Christmas is at our doorstep, a mere 2 days away. Can't wait, so here's a quick sharing on the Christmas celebration menu at The Roof, Asia's premium entertainment hub from their award-winning restaurants, Signature and Yezi. I had the chance to savour some of their Christmas fares the other day, and it was good. Check out what they have to offer below. 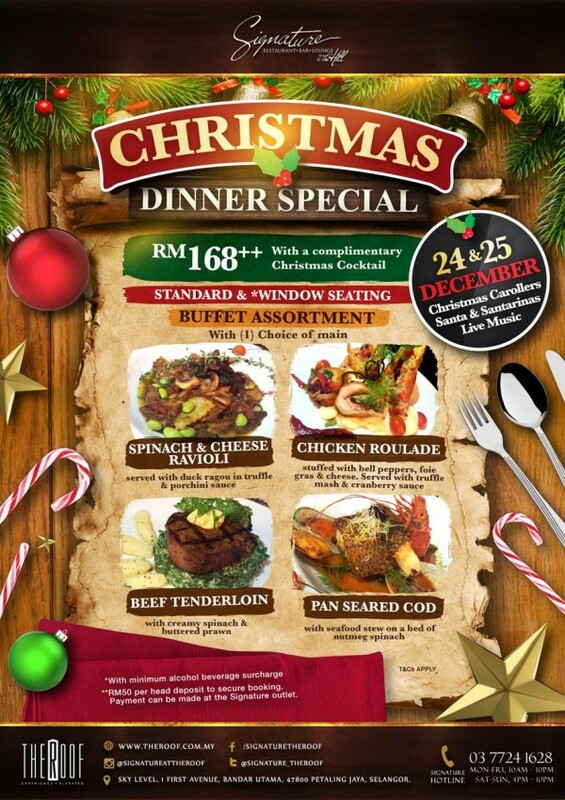 We tried out their Christmas Dinner Special, which will be available on Christmas Eve (24 Dec) and Christmas Day (25 Dec), priced at RM168++ per person with a complimentary Christmas Cocktail. 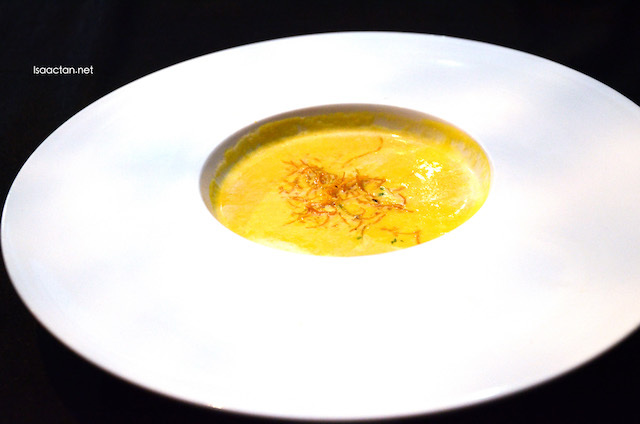 Kickstart your Christmas meal at Signature The Roof with their delightful homemade pumpkin soup. Prepared with a medley of yellow onion, pumpkin, ginger, thyme and carrots, it had a tangy, savoury and sweet flavour. Both rich in flavours, the creamy texture of the soup does make my tastebuds do a Christmas cheer. 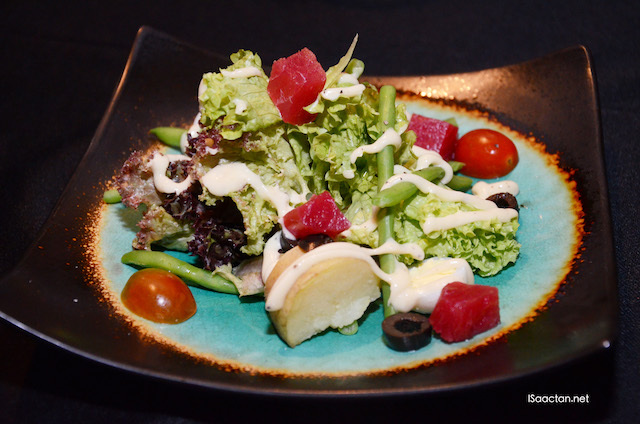 A healthy tasty Nicoise Salad ensued, consisting of quill eggs, red tuna, mix salad and mini french beans. Love how the red tuna adds that tangy element to the salad. Crunchy, refreshing taste to whet our appetite for the mains to come. 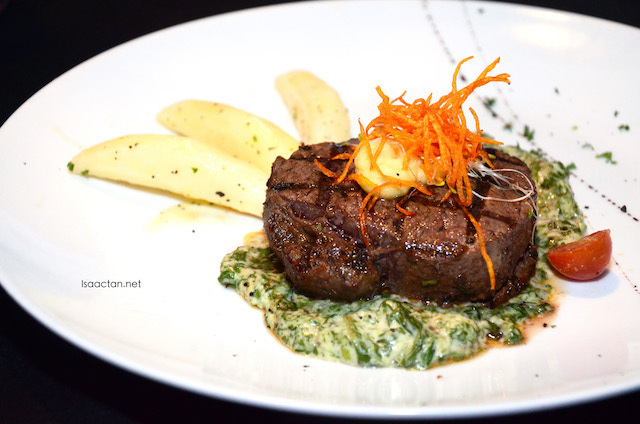 For mains, choose between Spinach and Cheese Ravioli, Chicken Roulade, Beef Tenderloin or Pan Seared Cod. I didn't know you could make spinach and cheese go so well together with ravioli thrown into the mix. 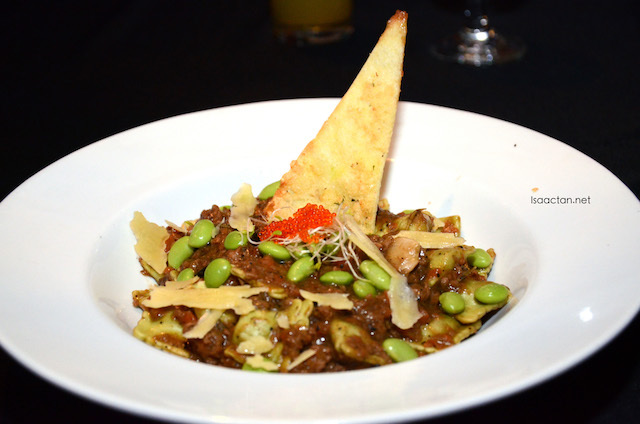 The spinach and cheese ravioli dish had duck ragout in truffle and porchini sauce. 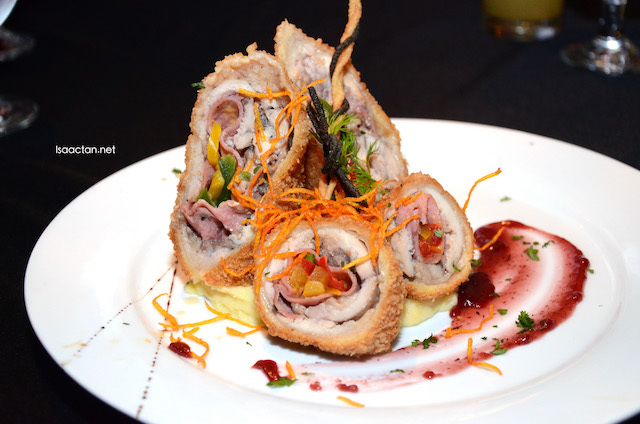 The Chicken Roulade was no slouch too, stuffed with bell peppers, foie gras & cheese and served with truffle mash & cranberry sauce. 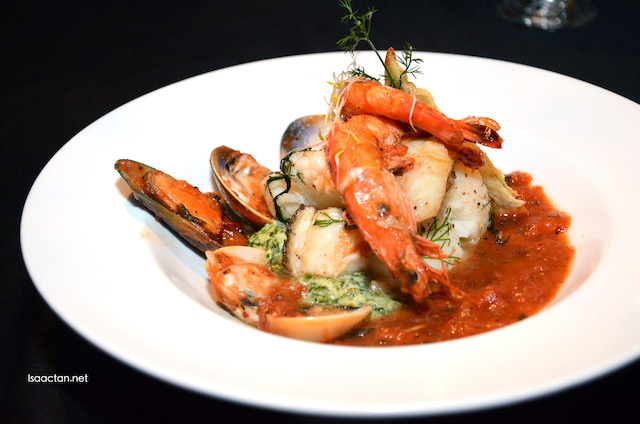 The Pan Seared Cod dish wasn't served with just the cod fish but with seafood stew on a bed of nutmeg spinach. Generous servings of huge chunks of cod fish with mussels and prawns were to be seen in the dish. Even a non-seafood lover like myself had to appreciate the way the cod fish was prepared, tasty and delicious. My favourite for the night would be this huge piece of Beef Tenderloin served by Signature The Roof being part of their Christmas Dinner Special. Served on a bed of creamy spinach & buttered prawn, it surprisingly went well together. For the first time in a long while, I'm satisfied with the HUGE portion given. 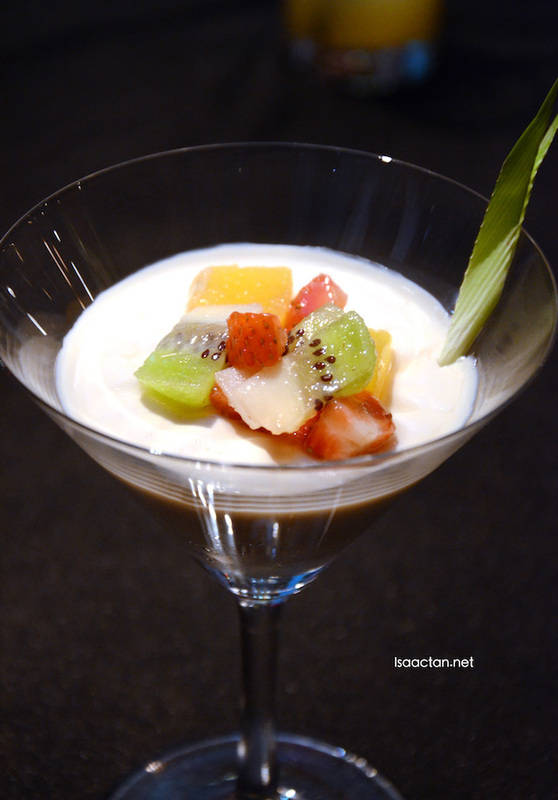 End your meal with some dessert, in the form of the slightly sourish Fruits Panna Cotta. The Christmas dinner special is priced at RM168++ per person with a complimentary Christmas Cocktail (shown in the first picture of this post)) which is a sweet medley of macadamia syrup, amaretto, red wine and rum. For more information, do log on to www.facebook.com/TheRoofMalaysia. For reservations and further inquiries, please call 603–7724 1628.
yummy, wanna go dine xmas eve, can suggest me where? wanna be cheap and good if there is as my dear says he got budget. Chicken Roulade, Pan Seared Cod and the Beef Tenderloin totally got my attention. 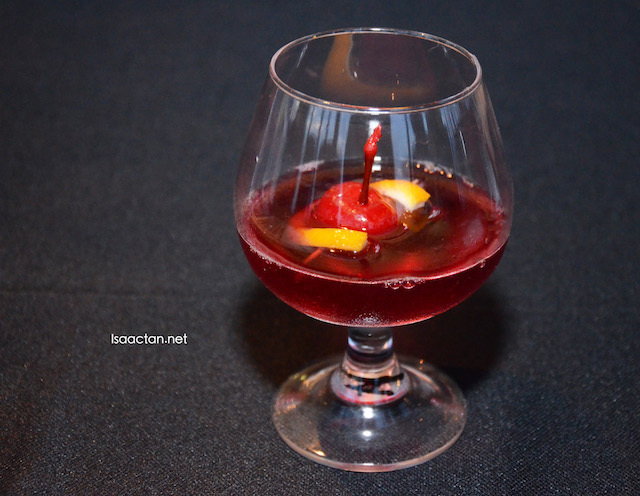 Love the vibrant color,bet it taste good too! Chicken Roulade presentation is nice. Looks delicious too. I want to try it too. soup and chicken roulade look very nice! their ravioli version looks very special too. So which one is your pick? I guess with two kids in tow, a romantic dinner for two is out of the question. Hehehehehehe!!!! THis is really very appetizing... and I love that pan seared cod as well as chicken roulade... they are really beckoning me..... oh gosh!!!!! The food look so delicious. A great Christmas meal. I know for sure I'll be celebrating Christmas in Ipoh. Too bad, or this would be a nice place for the occasion. Omg food presentation was so pretty and looking delicious too! Can have more choices for my Christmas Feast. The pictures are superb Isaac :) Love the way how they did the presentation for the food - looks amazing. The place and food are awesome, i m eyeing at that Spinach & Cheese Ravioli. Wow so lovely! Make me so hungry! What a colorful delicious looking foods! Yummy yums. Review their foods before and totally delicious!